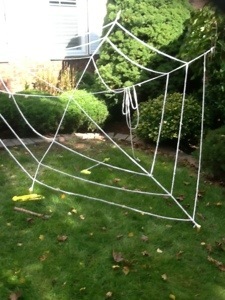 How to make a ten foot spiderweb | ARTZCOOL'S BLOG! I will be the first to admit, that for Halloween, I do get a little carried away with the costumes, and the decorating…but I do it all for the kids…right? Anyways, a few years ago I bought a few boxes of Halloween on Craigslist, and since then we have put up a display on our front lawn. We have a grave yard, skeletons hanging from the trees, rats and pumpkins all over, (just wait until we get the fog machine going!) 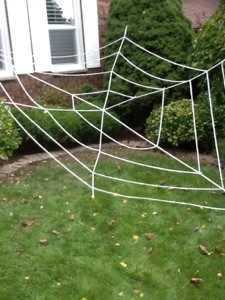 and my favourite, the giant spider web. First, we have to pick a good spot. 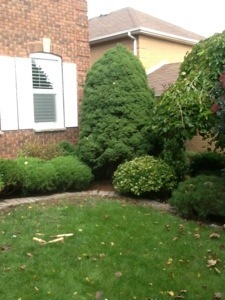 We have tried a few different places, but this year we are going to put it close to the house. 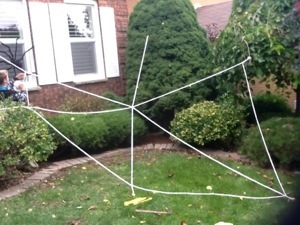 Start by stringing the supports, I just made a loop at the ends and hooked them around a branch or twig. 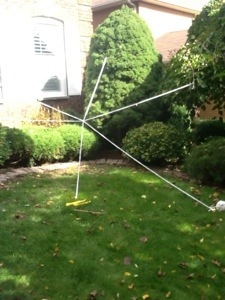 I hammered the other end into the ground using one of the tent pegs. 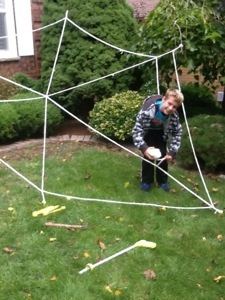 To make the rest of the structure of the web, attach two more support webs, so that the frame of the web is secure. I tied a few knots in the middle to hold everything in place. 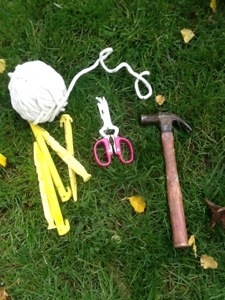 Then start weaving the web, start from the outside , and weave the string in a circle working your way towards the middle. I tied a couple knots as the sting passed by each support. Once you have gone all the way around the outside, move in and keep going around. The trick is to leave yourself enough string to get to the center. And repeat going around in circles, tying knots until you get into the middle. 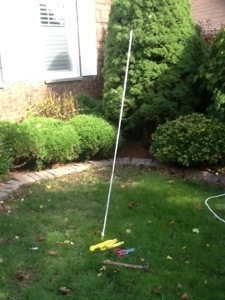 I had to loosen a few knows and slide the string in a bit to reach the center. 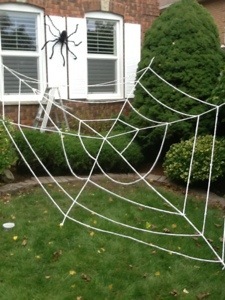 All it needs now is a nice big spider! 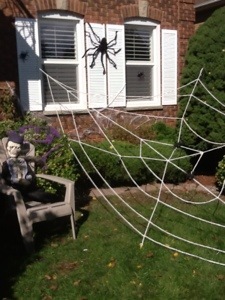 I decided to attach the spider to the house this year, just because it shows a lot more from the street. 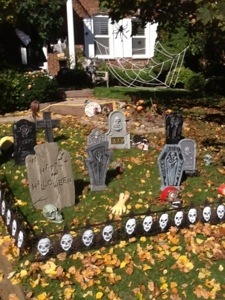 Here is our finished grave yard…you can see the web in the background. I will post some more photos of our decorations later…happy thanksgiving to everyone in Canada!